Dan Roberts, local historian and RCHS volunteer will talk about the history of communication from smoke signals to cell towers. Reservations are encouraged. Call 507-332-2121 to reserve a seat. Free for RCHS members. $3.00/non-RCHS member. This year is certainly proving to be a historic one – at least in terms of snowfall and school closings. This weekend’s blizzard has driven the snow plows off the road. They expect to be back at work (thank you, brave snowplow drivers) by the early morning, but don’t expect that all the rural roads will be cleared. The schools have closed for tomorrow, Monday, February 25. As per our policy to follow the Faribault School District’s lead, the Rice County Historical Society Museum will be closed as well. If you have any questions, please email our director at sgarwood@rchistory.org. Thank you. Stay safe. Are you looking for something fun for kids to do when there is no school on Monday, President’s Day 2019? Kids, families and friends are invited to the Rice County Historical Society Museum for a fun “I Spy” challenge. Participants will be asked to find a variety of kid friendly objects in the museum. 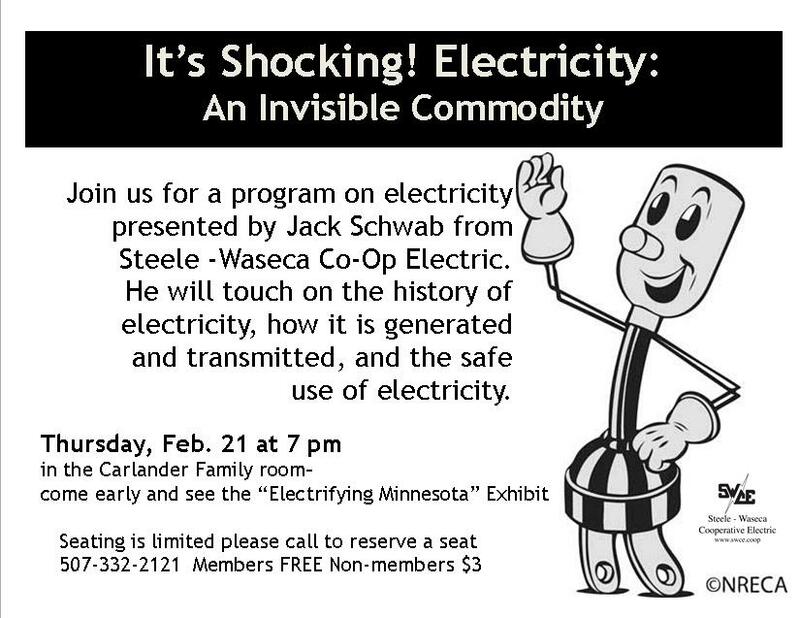 Plus, as an added bonus, you can also “Spy” and touch and learn with hands-on displays in the “Electrifying Minnesota” traveling exhibit. Completed “I Spy” forms will earn a prize. We will be open our regular hours from 9 to 4pm it will take 1- 1 ½ hours to play. No reservation is needed to play the game, if you played last time- there will be new challenges!